Interviewed this afternoon by BBC television journalist Mark Simpson about my reflections on the Anglo-Irish Agreement which was signed this day thirty years ago. 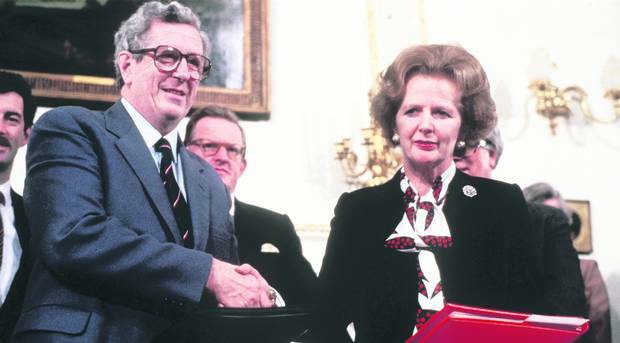 My opinion hasn’t changed: Thatcher’s aim was to secure increased cross-border security cooperation, and Fitzgerald’s motive was to help the SDLP and halt the electoral rise of Sinn Féin . 11th November. Interviewed on the Nolan Show along with Gregory Campbell MP (DUP) about the first arrest of a former British soldier in connection with the killings on Bloody Sunday. 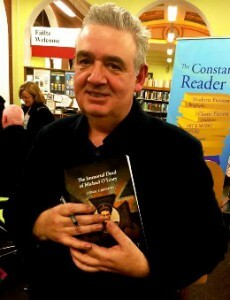 Spoke at the launch of my dear friend Conal Creedon’s book, The Immortal Deed of Michael O’Leary for which I wrote the introduction. 10th November. Interviewed by Amanda Morrow from Radio France International’s English service about the arrest of a former British paratrooper in relation to the Bloody Sunday massacre. 5th November. Interviewed on the Nolan Show about a poll on attitudes north and south to reunification and devolution commissioned jointly by RTE and the BBC. 26th October. Discussion with academic Caitlin Ball about community restorative justice. Unrecorded. 24th October. Spoke at event in Roddy McCorley Club, a tribute night to the late theatre director, Pam Brighton. 23rd October. Interviewed by Stephen Nolan on BBC Radio Ulster on the supposed status of the IRA Army Council and current talks to resolve differences on welfare cuts. 22nd October. Interviewed by Alex Gibney for US documentary on collusion. 10th October. Took part in a massive protest march though Berlin against the TTIP (Transatlantic Trade and Investment Partnership). Finished reading The Last Jews in Berlin. 6th October. Went to hear former Greek Economic Minister, Yanis Varoufakis speak on a panel discussion at the Volksbühne Theater on Rosa-Luxemburg-Platz on the topic, PLAN B FÜR EUROPA? 4th October. Staying at the Literarisches Colloquium Berlin, at Wannsee, having successfully won an award for a two-week residential. Aim to return to Belfast with at least 25,000 words of my long-delayed manuscript of Band On The Run. 3rd October. Met with refugees at Sozialwerk Nazareth e.V, Norddeich, including a young singer from Angola who performed a brilliant rendition of Jason Mraz’s I’m Yours, and also met with English Literature and music teachers from Dame Allan’s Schools, Newcastle-Upon-Tyne. 1st October. Addressing students on the cross-over literary devices, techniques, allusions and imagery employed in public speaking from Winston Churchill to Barack Obama, with quotations from literature and the Bible.Gave the opening speech at the conference of Relais de la Memoire, an organisation aimed at young people and promoting reconciliation and understanding in Europe and beyond. Spoke of my life as a writer, the novels I had written which dealt with conflict, and other novels such as All Quiet on the Western Front and the writings of former Wehrmacht soldier and novelist, Nobel Laureate Heinrich Böll (whose Achill Island house is now a writers retreat), and repeated an earlier address to students about literature and conflict. The delegation included students of A-Level age from Marseilles, Paris, Newcastle-upon-Tyne, Vienna and Norden. This was followed by a Q & A. Later met with 92-year-old Erna de Vries, a German Jew, who survived the Holocaust, and whose mother was murdered by the Nazis. 30th September. My first class at Ulrichsgymnasium, Norden. Spoke to senior pupils about the short story. On their course is My Son the Fanatic by Hanif Kureishi and I broke them into four groups, listened to their analysis and explained various points to them about the story. Later in the morning, I addressed 200 English language and literature students in the Assembly Hall on my journey as a writer; spoke about the inspiration and German connection between my novel Rudi and Hermann Hesse; spoke about peace walls in Belfast and the coming-down twenty-five years ago of the Berlin Wall, and how Irish writers responded to continued division, conflict and partition, and then did a Q & A. In the afternoon, I took a class of 20 students on the issue of ‘migration’ and ‘translation’. The students had read Rudi and enacted/dramatized three scenes from the book dealing with alienation. Followed by a Q & A. 29th September. Arrive in Germany for speaking tour. 25th September. Interviewed on the Nolan Show with Liam Clarke about my tweet that ‘Peter Robinson is finished’. 24th September. Interviewed in studio on BBC’s Talkback with Winston Irvine about republican/loyalist murals.